Thursday was Auction Day! We got up early and headed over to the Carnival Grounds where we had already left our lawn chairs a few days earlier. I was smart this year and remembered where the sun rose the year before – so I made sure to position my chair on the right side of the wooden awning so I’d still be shaded long after the sun rose. It wasn’t the “most” ideal spot to take pictures, as I was a couple rows behind people – which meant to get a clear shot I had to stand up (and block the people behind me). But I tried to do so quickly so everyone could see. The prices for foals this year were still way down from previous years (even though last year was even lower). It really makes me wish I was in a position to buy a foal. But alas, it costs much more than the price to buy the foal at auction – you have to then feed/hay them, pay for vet and farrier bills, and boarding. Someday I dream of buying one at the auction (Minnow came from the auction in 1993, but I did not buy him then). The highest priced foal was a buy back foal that sold for $6,700 to the buy back babes. The buy back babes are a group of people that pool together their money to buy foals that are buy backs meaning they will be sent back to the island to live for the rest of their lives. One of the most exciting parts of the auction was when one of the foals nearly escaped. See the foals are brought out into the auction arena by several people who try to hold the foal from escaping. For most of them this is their first contact with a human – resulting in many bucking/rearing ponies. And this is exactly why one of the ponies was able to wiggle free from it’s handlers and made a mad dash towards one of the exits. This is the only shot of the “escape” I was able to get (it happened really fast) but as you can see one of the Saltwater Cowboys was able to grab the foal by the tail before he was able to make it all the way out of the exit. I’m not sure what they would have done had he gotten all the way out – which also made me wonder why there is open chutes to the auction pen. Any “rogue” pony could escape into the fairgrounds – which is also not completely fenced in. The rest of the auction was rather tame – well as tame as you can get with a bunch of feisty wild foals. I’ve always wondered why the cowboys try to hold the foals, it would probably be a lot easier for them if they just corralled them into a holding pen in front of the auction crowd. Although I get the impression that this method is tradition – and it’s actually pretty entertaining. A family sitting in front of me at the auction decided to buy one of the buy back foals – spur of the moment. I watched the kids all day long begging their dad to buy them a buy back pony (his wife was begging too). I think it was their first time at the auction, but they must have been swayed by the moment, because their dad ended up buying one of the buy back foals for about $4,500 (I forget the actual price). After the auction we grabbed some lunch at the fairgrounds and then headed to mainstreet to meet Cezanne. Cezanne’s claim to fame is that he was the highest priced foal sold at the 1989 Chincoteague Pony Auction at $2,500 (Sold to Kevin McBride, the famous Chincoteague Artist). He has gone on to sire many Misty family ponies over the years and continues to do so where he lives now in Ridgely, MD at Hawkeye Stables. Across the street at the Library I stopped in to see Misty’s Heart of the Storm visiting with her public. Heart of the Storm is Misty’s Great Great Granddaughter and is helping to continue on with her legacy. Then we headed back to the Pony Centre for the Pony Shows. Minnow’s first painting was reminiscent of Wildflowers! And thankfully my dad and sister decided to come down for a few days – which means I was able to get some pictures/video of Minnow performing. The lighting inside the Pony Centre wasn’t ideal, but they were still able to get a few action shots of Minnow performing his new skit. In between shows Minnow painted “Raindrop” for one of the girls at the Pony Centre – she named it after her Misty descendant Chincoteague Pony, Raindrop. We also spent a little time watching the ponies out front in the corral, mostly this pony, Miss B. We discovered that Miss B was Blitz & Boomer’s little sister! She shares the same stallion (Chesapeake Powhattan’s Promise) that our boys do. We thought she really took a resemblance to Blitz, including the “lightning strike” on her rump. Miss B is 3 years old, and has already taken to pony rides like she was an old pro. Then in the evening show Minnow painted one of my favorites, Chincoteague Island Sorbet – doesn’t it remind you of ice cream? Which after the evening show I headed promptly to the Island Creamery to get my fill of ice cream! Yum! Tomorrow I hope to have our final recap of Pony Penning 2011, complete with VIDEOS of Minnow painting and performing. So check back soon! Check out all of our Pony Swim Pictures at Green Horse Studios! 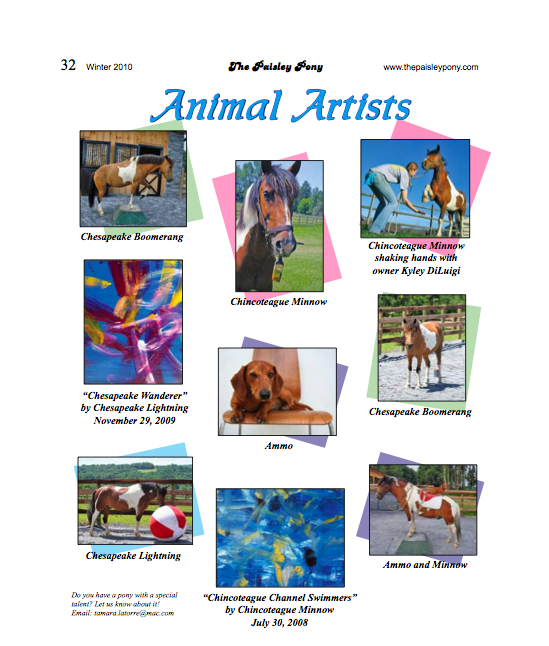 The Trick Ponies of Chincoteague and their sidekick, Ammo the Dachshund, were featured in the Winter 2010 Issue of The Paisley Pony. Ammo thinks he’s hot stuff now after I showed him his first published article. He told me he only signs autographs for his fans that bring him dog cookies. I’ve created a monster! So head on over to The Paisley Pony and check out the Winter 2010 Issue.